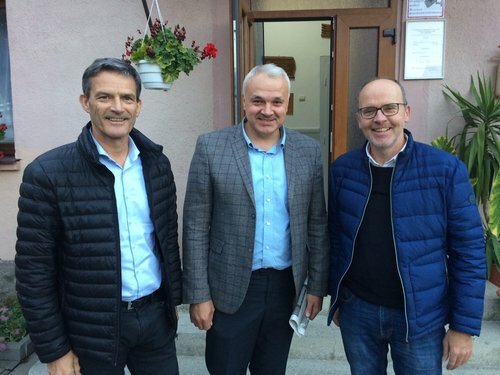 The group traveled to Transcarpathia and were greeted warmly upon arrival by the Presidium of the Transcarpathian Reformed Church (RCT), Sándor Zán Fábián, Bishop of the RCT and Béla Nagy, Lay President of the RCT and Director of the Diaconal Coordination Center (DCO). Those in attendance at the consultation included Matthias Herren, HEKS Regional Coordinator, Rev. Barnabas Balogh and László Varga, Directors of Hungarian Reformed Church Aid; Rev. Balázs Ódor, Ecumenical Officer of the Reformed Church in Hungary. Local DCO coordinators were present, as well as visitors from the Evangelical Church in Rheinland, the Diacona Austria, the Bread for the World Organization, the Evangelical Church in Baden, the Reformed Church in Germany, and the Old-Reformed Church of Niedersachsen. Also in attendance were Martina Wasserloos-Strunk, President of the European Area of the World Communion of Reformed Churches and Enno Haaks, General Secretary of Gustaw Adolf Werk, Germany. The visit provided opportunities for expression of solidarity, a safe space for straightforward discussions among partners about the challenging political and social situation of the Hungarian Reformed community in Ukraine, and chances to visit projects and for donors to make commitments for future support of the diaconal and social ministry of RCT. The Reformed Church in Transcarpathia is the oldest Protestant Church in Ukraine. It was founded in 1921, when the Sub-Carpathian region became a part of the Czechoslovak Republic. During the Soviet era, the Church lost its legal status and many church-owned properties were seized and naturalized. The structure of the Church did not exist, atheist propaganda was promoted and many pastors were deported. Eventually, the fall of the Soviet Union brought relief, and with the help of Church sponsors, schools and churches were re-opened. The Church currently has around 70 000 members, most ethnic Hungarians, in nearly 100 congregations. It is organized into three Presbyteries: the Beregi, Ugocsai and Ungi Presbyteries. It is a constituting member of the Hungarian Reformed Church, which was established in May 2009 and consists of Hungarian-speaking Reformed communities in the Carpathian Basin. It is also a member church of the World Communion of Reformed Churches, just like CPCE and WCC. Transcarpathia, situated in the West of the Ukraine, is an underprivileged region of the country, and has become even more depleted since the country became affected by civil war. Additional hyper-inflation and the drop of the currency, the Hryvnia, have led to enormous problems in the economy. The government is only able to survive financially due to payments from the EU and the IMF. 75% of the population is poor and around 30% are living under the subsistence level. According to estimations, between 50% and 80% of people don’t have any form of employment, and those who do have employment often don’t earn enough to make their living, as the minimal wage is around 45 euro per month. The crises in Ukraine all originate from the same sources: the war continues and the failing economy. Bishop Zán, in his presentation, emphasized that the most challenging thing that the Church faces, is the massive emigration of Hungarians, including church members, thus finding ways to keep pastors and employees in the country has become more difficult. The RCT is a partner of the HEKS Church Cooperation (CC) in the Transcarpathian region, working to provide aid to those in need in order to strengthen disadvantaged people and minority groups and to improve their social inclusion. Since the 90’s, RCT’s Diaconal Coordination Centre coordinates and implements different projects, which are mainly financed through churches and relief organisations from abroad. All projects aim to improve the living conditions of the most deprived people in the area. HEKS has cooperated since 1991 with the Church and aided in the founding of the Diaconal Coordination Office in Bergszász in order to coordinate the relief and contributions from other churches abroad. Since the 1990s, DCO has developed into a large diaconal center with a social kitchen, a bakery, an elderly home, a center for custom clearance and distribution of goods, a crisis shelter for women and children, and a center for humanitarian aid. During the last two years, due to the deep poverty caused by the war, DCO has also coordinated extra emergency aid as well as relief programs with assistance from the Hungarian Reformed Church Aid and the Hungarian government. During the trip, international partners were able to see first-hand the full range of programs that the RCT offers in the region through DCO and beyond. The group made trips to visit a social kitchen, an elderly home and a shelter for women raising their children alone, as well as rehabilitation centers providing day center for children and young people with disabilities, Roma afterschool projects and the Home Care network of the Church. Since 2014, the Reformed Church in Transcarpathia runs two rehabilitation centers for children and young adults with disabilities. The “Forget Me Not” Foundation of the Church, coordinated by Krisztina Badó, runs daycare home in Mezővári and Hetyen. This social project is based on surveys that took place in the towns nearby with the help of local pastors and clinics, and recorded the number of families in the 12 neighboring towns with loved ones with disabilities. The mission of the program is twofold: to do as much as possible so that the children may have a better life, and to help families who live their lives with such burdens and hardships. Beyond the rehabilitation of the children, the Church also tries to support the families. Conferences are organized for the parents involving specialists from different medical fields who give presentations on different topics, such as Autism. Currently 46 children are attending regular activities in Mezővári, and more than 40 children in Hetyen. Thirty-one colleagues are working in these institutions. This valuable opportunity allowed the organizations to see how the DCO operates and discussed the framework in funding their work. In this way, each organization is supporting a different project so that the financial aid is spread out and each vital ministry is getting the support it needs. Through these immersive and hands-on experiences, visitors were also able to see developments implemented as a result of the HEKS support of the RCT since the first roundtable discussion in 2009. This gathering was the fifth of its kind.